One concern of today's soldiers is the inability of current ( 9 mm ) sidearms to penetrate the soft body armor that is standard to all combat troops. To do this requires a new system of both gun and ammunition. The Belgian Fabrique Nationale P90 is the leading weapon system to meet this need. 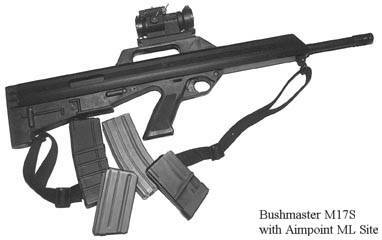 This gun is of an advanced design featuring an all plastic outer shell, bullpup configuration, and limited low-light sighting. Suppressers, Tac-Lites, and Laser sights are also available. It has a top feed 50 round clip containing special, high-veocity, dual core bullets. The 5.7x28mm cartridge also known as the SS190 is backbone of FN's new weapon system. Originally created for the FBI for by AUTO ORDNANCE. The Thompson Sub-machine Guns were taken from the FBI's own stock. Only a few were converted from .45ACP to 10mm. Apparently, a few 10mm models were manufactured for the public to test out the waters but sales were slow so large-scale production did not follow. In 1994, the U.S. Army officially adopted its second carbine of the 20th century. Though carbine versions of the M16 had been used all along (the XM177, and the CAR-15), demand for these was limited to select groups. With the increase in the use of Special Operations forces during and after the Cold War, the demand for a shorter, lightweight weapon was increased. while maintaining the ability to mount an M203 grenade launcher. In the collapsed position, it measures under 30 inches, and weights just over 5 1/2 pounds, with an effective range of 600 meters. The M4 is available with 3-shot bursts (M4) as well as full-auto capabilities (M4A1). Both versions of the M4 are equipped with a Picatinny-Weaver Rail system to replace the carry handle. This allows for a variety of sighting systems to be mounted atop the receiver, from the standard handle with A2 sights to night-vision devices, scopes, and lasers. Although it is quite different than either the AR15 or AR18, those familiar with the other rifles will find operation of the M17S to be virtually identical to the AR15/M16. The non-reciprocating charging handle is atop the upper receiver and actually forms the aft portion of the carrying handle. The magazine release is virtually identical to that of the M16, save for the fact that it is ambidextrous, which is very handy when removing the magazine using the left hand and thumb. The bolt release is also virtually identical to that of the AR15/M16 and functions in precisely the same manner. Other than appearance, the only real difference between the manual of arms for the M17S and the AR15/M16 is not having to remember to close the ejection port cover after releasing the bolt. The M17S uses standard AR15/M16 magazines. As to the utility of the M17S for self defense, minion hunting, and law enforcement work, it has a lot going for it along with a few shortcomings . First and foremost, the little rifle is handy! The M17S’ overall length of 30 inches is shorter than 16 inch barreled AR15, M177, or M4 Carbines with stock collapsed, while the M17S has a full 21.5 inch chrome plated barrel. This makes it an ideal size for use in a vehicle or anywere space is at a premium and deployment of any long gun generally makes exiting a vehicle or enclosure cumbersome. The M17S can be taken by the pistol grip and deployed essentially 'at the ready'. The placement of the pistol grip at the balance of the rifle enables it to also be comfortably carried and fired with one hand if necessary, unlike M4s or AR15s, which are awkward and muzzle heavy at best when fired in the this mode. We cannot overemphasize the outstanding balance and overall handling of the M17S. 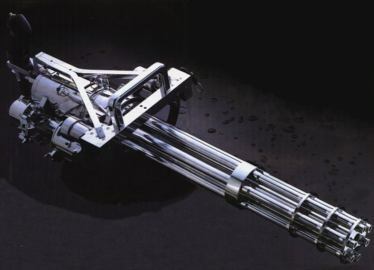 The M214 is a six-barrled Gatling gun powered by three car batteries, and fed by a 1000 round drum. When the ROF is set at 5, the weapon can be fired without a tripod. We also allow Cyborgs and some dark races to fire at a ROF of 50 without the tripod ( just like Gov. Ventura did in Predator ). Provided they have both Strength and Constitution of at least 14. The Swiss-made SSG 3000 from SIG is a precision-made rifle which, in the hands of a well-trained marksman,will produce consistent results of the highest order. The SSG 3000 is a bolt-action rifle firing the standard NATO 7.62mm round. The weapon uses the very latest in weapon design technology and has been developed using the Sauer 200 STR target rifle as its base. The weapon primarly a police sniper system has no iron sights, due to the fact that it is intended to be used solely with telescopic sights. It can accept most optical sights, including night-vision equipment and NATO STANAG equipment, but the Hensoldt 1.5-6 x 42BL has been specifically designed for use with the SSG 3000. This sight unit is attached to the rifle by means of a mounting which allows for axial adjustment to suit individual users' eye relief length.